Following an overnight decision by the University of Texas at Austin to remove three confederate statues from campus grounds, reactions from Texas lawmakers were mixed. Confederate Soldiers Monument at the Texas Capitol. Following an overnight decision by the University of Texas at Austin to remove three confederate statues from campus grounds, reactions from Texas lawmakers were mixed. Meanwhile, the debate over symbols of the Confederacy continues to ricochet in cities across the state. • Lt. Gov. Dan Patrick criticized UT-Austin early Monday morning, saying the decision sent a "poor message." But U.S. Sen. Ted Cruz avoided weighing in. "It’s appropriate for each university to make that decision," Cruz said. "It was the university’s prerogative to make that decision." • For those counting: Three down and more than 170 still up. According to data gathered by the Southern Poverty Law Center, Texas has more than 170 public symbols of the Confederacy in the form of schools, roads, monuments and more. Explore the full list here (and let us know if we're missing any). • In other Confederate monument news: The Dallas City Council has agreed to take down some Confederate statues — but council members are arguing over the how and the when. Texas A&M University says it has no plans to remove a statue of Lawrence Sullivan "Sul" Ross, a former campus president, Texas governor and Confederate general. And in Houston, a man was charged with trying to plant explosives at the statue of Confederate officer Richard Dowling in Hermann Park. • The Employees Retirement System of Texas is considering lowering its earnings assumption. Labor advocates fear lawmakers would respond to the change by shifting more financial burden onto the system’s beneficiaries. • Texas Agriculture Commissioner Sid Miller is furious with the Six Flags amusement park chain over its decision to take down the Confederate flag. • The El Paso City Council narrowly voted against creating a municipal identification card program amid concerns that the measure would lead to the border city being perceived as a "sanctuary" jurisdiction. • The Texas Court of Criminal Appeals on Monday halted the execution of a convicted child murderer who claims he’s intellectually disabled. • Texas has more than 170 public symbols of the Confederacy, according to one report. Explore them all here. • Lt. Gov. Dan Patrick criticized the University of Texas at Austin's decision to remove Confederate statues from its campus late Sunday night as sending a “poor message." • About 840,000 mostly low-income, immigrant Latinos have settled in colonias along the border – cheap plots of land outside city limits without basic infrastructure such as water and sewage systems, electricity and paved roads. • Don't forget: Tell us which local control issue we should explore next as part of our ongoing Power Trips series. We're excited to announce U.S. Sen. Al Franken, D-Minnesota, will open the Texas Tribune Festival with a conversation on his best-selling memoir, "Al Franken: Giant of the Senate." Join him and 250+ speakers at the Fest. Links below lead to outside websites; we've noted paywall content with $. 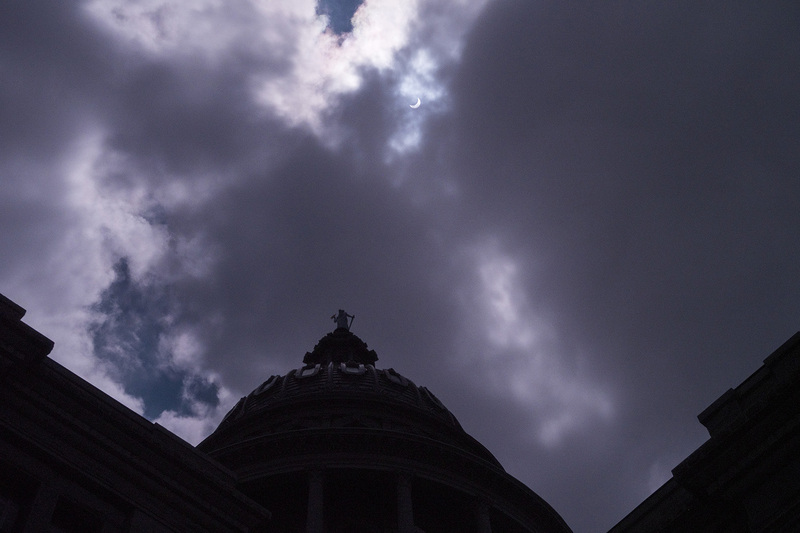 The Texas Capitol at the height of the solar eclipse on Monday. Photo by Bob Daemmrich for The Texas Tribune. See more photos on our Instagram account.